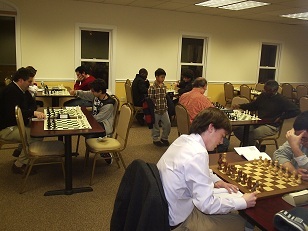 Tonight’s tournament featured three highly competitive quads. The first quad had four masters. Daniel Lowinger seemed to be cruising to victory, but was stopped in the final round by Ian Harris. Lowinger still managed to win the tournament with 2/3. Tyler Leite won the second quad after escaping against Lee Arthurs in the final round. Arthurs had an advantage, but the severe time trouble prevented him from finding the best continuation. Meanwhile, Guy Colas impressively swept his quad, defeating everyone who stood in his path!